All these photographs have been created, without any darkroom processing, and without a computer. It is the projector that provides all the magic! The first and easiest way to begin is to experiment with the projected image, try projecting a favourite portrait on to a textured surface, to be used as a screen. Be sure to have a selection of different white materials to hand such as; linen, damask or watermarked fabric, for fine textures. For coarse texture try loosely woven mohair or a heavy knitted wool pullover. It will soon become obvious that the size of the image projected is another way of making the texture appear coarse or fine. The next stage is to test some films, in order to find one that produces the best results. 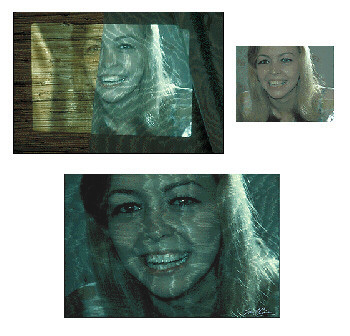 Project the portrait on to the selected texture. Then photograph what can be seen. The room should be fairly dark. Experiment first with different types of film, to see which results are liked best. There are advantages in having made a choice to stay with that film, as experience gained under these rather special light conditions will save film from being wasted. Sometimes a film balanced for daylight with a blue filter is much better than a tungsten film. So much depends on the projector used. An enormous variety of textures are possible to use, they do not always need to be white, nor do they always need to be flat. Even a parquet floor could be used, once one has mastered how to stay on the ceiling with a camera and a projector! Have a look at plate 10 (above). There is likely to be an element of distortion, as it is not possible to have the camera lens in exact alignment with the projector, but do not worry about this yet, distortion is the subject of the next chapter. A projected portrait but not on to a screen. The use of a texture in portrait work is particularly attractive some of the beauty and character found in painted portraits is lacking in photographs. This is due partly to the interest an artist can arouse in the beholder, by the abstract quality, created by the choice of paints used and by their application. The palette knife for coarse or the brush for fine texture. The realism of the photograph becomes more abstract simply by adding a texture and this can bring out more expression or character than was evident before. This does not mean that one is copying paintings as totally different images are created from those ever painted, but that this abstract quality that so enriches portraits, can also now apply to photographs. 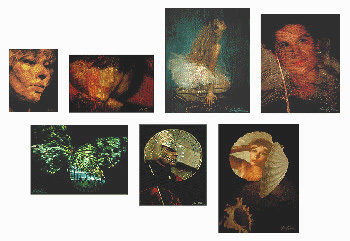 The accidental projection of a portrait on to the fabric instead of the screen, that started this whole concept, resulted in the creation of plate 13 (above). The portrait, plate 8 (below) the author's wife, was projected on to a blue watermarked silk. It was necessary to project a relatively small image in order to gain the strength of texture required. Plate 11 (below) is a portrait of the author's mother that has been projected on to an ostrich feather. An old piece of canvas, that had been used to clean the brushes of an oil paint artist, was used to create plate 12 (above). This piece of canvas was streaked with many colours and it was a matter of trial and error, to find an area that worked well with this image. 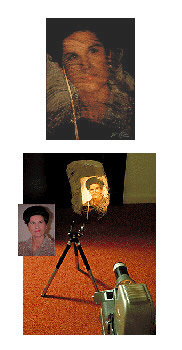 A projected portrait on to a feather was then photographed as seen.